Our organization holds expertise in providing Journal Bearing Onsite Rotor Shaft Grinding, Onsite Alternator Shaft Repair, Onsite Repair of Rotor Shaft, on site repair of Turbine Alternator Journal. 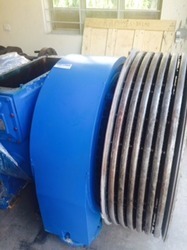 We are backed by experienced and trained team of professionals, which uses advance equipment designed for in situ repair of turbine alternator journal having dia meter upto 700 mm. and can be extended up to 1500 mm. dia. Our organization has already executed more than 100 jobs of on site journal grinding and rebuilding. Turbine Shaft Repair services offered includes handling onsite repairs of Gas, Steam, Hydro turbines and find support in industry sectors like Petrochemical, Shipping, Power Industry. These services involve grinding & polishing of rotor shaft, turbine shaft, alternator shaft as well as also include offering support for rebuilding rotor shaft, alternator shaft and turbine shaft. Here, while delivering the services we ensure that repairs offered are reliable and cost-effective as per highest international standards. Turbocharger casings are repaired and complete Turbochargers are reconditioned. Second hand Turbochargers of ABB, GE, Napier and all makes are available with guarantee. Tri metal, Thin shell type, white metal bearings are manufactured for diesel engine. Turbine Shaft Grinding services offered are handled by experienced industry professionals that allow us in achieving flawless execution standards and in supporting the needs of eliminating downtime associated with disassembly, transportation equipment reinstallation. Here, we have with us extensive experience in offering onsite repairs of Gas, Hydro and Steam turbines as well as offer service support to clients from Power, Petrochemical & Shipping industry. 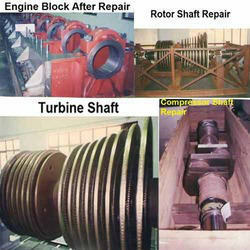 We undertake on site repairs of turbine and alternator journals by using most modern equipments available. We have highly skilled team of engineers, in-house facilities for crack detection, hardness and surface finish test and rebabbitting and manufacturing of white metal bearings. Most recently we have executed a job of Turbine Journal for Shandong Jinan Power Equipment, China. In case of excessively worn out or damaged journals we undertake rebuilding and on site grinding as per standard size. 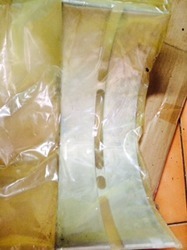 Surface finish in terms of RA value maintained with in 0.30 microns. In house facilities for crack detection, hardness and surface finish test. 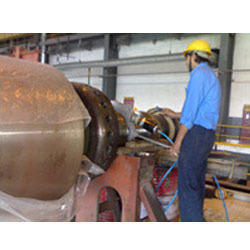 In situ Equipment available to execute repair of Turbine and Alternator journal up to diameter of 700 mm. and can be extended up to 1500 mm. dia. 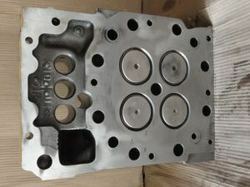 Cracked or damaged cylinder head repair is undertaken by metal stitching process. 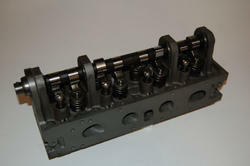 Cylinder heads are completely reconditioned by change of valve seats and valves tested hydraulically. 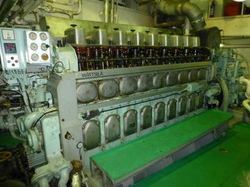 Engine block repair is done by metal locking, metal stitching and by line boring. 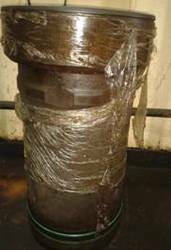 We develop and manufacture Cylinder Liner as per sample or drawing. 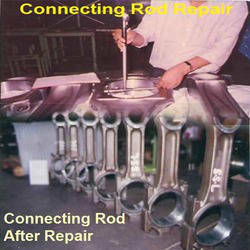 We undertake Connecting Rod Calibration Service and Reconditioning. We have well established procedure for Connecting Rod Calibration Service.